US, 2012, 91 minutes, Colour. John Hawkes, Ryan Simpkins, Ty Simpkins, Kendall Toole. 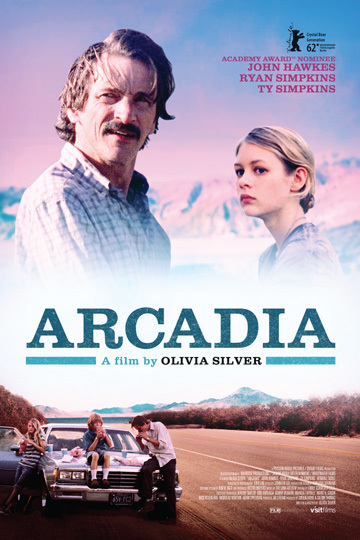 Arcadia is a small independent film about a family, father and three children crossing the United States. There is a wide range of locations as they movie from state to state. However, it is the strong performances which count, especially John Hawkes as the touchy and sometimes desperate father. He had proven his acting skills in such films as Winter's Bone and The Sessions. 1. A film about family? Relationship between father and children? Absent mother? 2. The title, a suburb of Los Angeles, an ideal destination? 3. A road film? From the east coast to west coast? The range of scenery, states, terrains? The songs, musical score? 4. The basic situation? The father of gathering the children, their leaving the home, his change of a child, the absence of a mother? The explanations for her absence? 5. The children unwilling to go? The oldest and her knowing the truth? Greta, her discontent? The boy and his wanting his mother? 6. The character of Tom? Coping with his wife, her breakdowns, her being in the institution? His not wanting to tell his children? His cover-up? His love for his children? Yet irritation? 7. His manner, his bad behavior towards people, to the woman in the diner? Her ‘attitude’? Towards the people at the motels? His reaction to the police? 8. The details of the journey, the behavior of the children in the car? Greta listening to the music? the critical conversations? Greta and the phone calls? 9. The arriving at the relations’ house? The welcome? Phone calls? reassurances? Tom falling out with the relatives, his impetuous leaving? 10. The argument with Greta, leaving her on the side of the road, returning? 11. Arriving in Los Angeles, the children’s response, the new house, settling in, the promise of the pool? The inflated material for sleeping? How would they settle into the house? 12. Tom and his continuous phone calls, expectations about the job? 13. The final phone call to their mother, the background of her breakdowns, her manner towards her children, being in the institution? 14. The strength of the portraits of the father, the three children? Tense relationships, the children’s ages? Their responses? 15. A small film, but with valuable characterisations?